It's a goldmine of revenue opportunities! 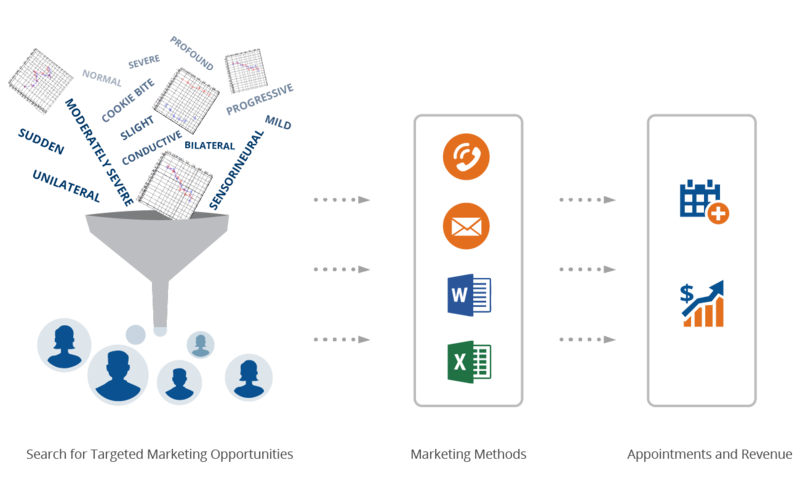 TIMS Noah Data - a goldmine of REVENUE opportunities! Annabelle, in TIMS Audiology Support, consistently demonstrates personal qualities and skills that reflect extraordinarily on her. She has a great attitude and always focuses on the problem at hand, while not losing sight of the larger list of constraints and issues that are present. I cannot say enough good things about Annabelle! In our #TIMSAudiology training, we learned how to narrow device choices so that we no longer have to page through fifty-some devices to find the one they we looking for. We are extremely pleased with our training and with TIMS overall. Having used TIMS Audiology for many years, I have been most impressed with the forward thinking of the Computers Unlimited staff in regards to maintaining HIPAA compliance, moving toward a paperless office and increasing effectiveness through software upgrades. Our audiologists and front office staff are able to work more efficiently and I am able to more accurately track outcomes of their work, thanks to TIMS. I have recommended TIMS Software to colleagues, and I continue to do so with enthusiasm. I will continue to recommend TIMS Audiology for everyone who struggles with their office management system. Your software is the best I’ve found. The support of your team is unbelievable. 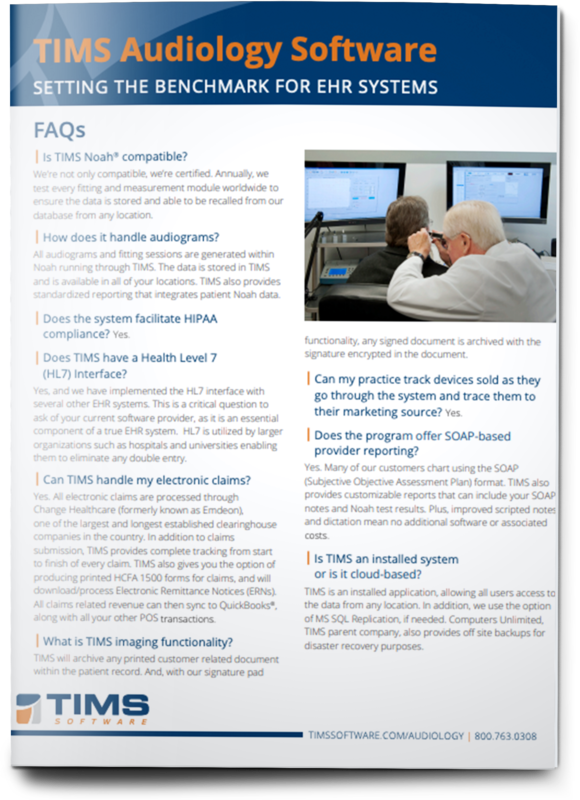 We spent several years researching several audiology software packages before we made a final decision on TIMS Audiology Software. In the end, what we found was TIMS had the best user interface. It was simple and easy to use. The fact that CU was developing new interfaces was very appealing to us, for example – the QuickBooks integration. We were aware that the QuickBooks integration was not ready to use at the time we began using the software, but that the development would be completed shortly. That was a big selling point for us – knowing that CU believed in product development. One of the biggest changes we saw was the ability to process electronic claims; we simply did not have a way to do that before. So until TIMS, we had to use a third party billing service and the lag time for payment was significant. The turnaround time from billing to payment has been reduced. TIMS Audiology is by far the MOST user friendly, intuitive and flexible software we have ever encountered. The TIMS training at CU opened their eyes to exactly just how much we can do and how easily we can customize the software to make our jobs easier and us more efficient. We have had so many issues the last half of the month into the beginning of this one. It wasn't until BJ got involved that things actually got fixed and put back together. I wish we would have contacted him first could of saved ourselves ALOT of headaches. Thanks BJ ! We appreciate you . Shaun was wonderful, she was very patient and explained things clearly. We raised a number of clarifications and she responded in a gentle and splendid manner. Thank you, again Shaun. I just spoke to David and let him know how much I appreciated working with all of you over the past several years. The program we are forced to use currently (Blueprint) cannot even hold a candle to TIMS! TIMS is so much easier to access in all areas! I am still referring back to TIMS on a daily basis. I keep it open at all times along with Blueprint. You have a great product there and I would highly recommend it anytime to anyone! Thanks again for all of your support! Very impressive work by BJ who had to walk me through downloading of session to enable his access to NL Frontdesk - he kept in touch throughout which was very helpful; very much appreciate assistance and fast resolve. Shaun is amazing. She is informative, friendly and patient. I feel a higher level of confidence after just these few sessions and am thankful that she is available should I run into any questions. A+ & THANK YOU! I deal regularly with both Shaun and BJ and can't say enough good about them - they teach with patience and resolve problems - we're so happy we committed to TIMS! There are 13 questions and answers to help you understand what you should expect with a complete EHR System. TIMS celebrates many firsts, from the first provider to develop a fully integrated Electronic Claims Management System, the first to fully integrate NOAH, and the first to integrate directly with QuickBooks. Get your questions answered during a free consultation with one of our industry experts.